White cotton personalised handkerchief featuring a cute little Seahorse motif. White cotton personalised handkerchief featuring a cute little Seahorse motif. Select from one single hanky or a gift set of 3 handkerchiefs. 28cm size hankies are used for both ladies and kids. 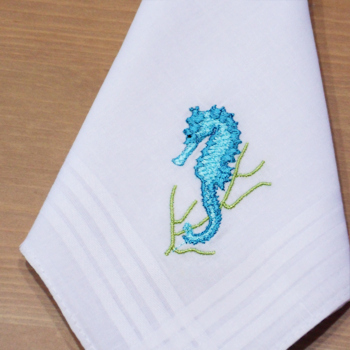 White cotton personalised handkerchief featuring a cute little Seahorse motif. Select from one single hanky or a gift set of 3 handkerchiefs. 28cm size hankies are used for both ladies and kids. Just fill in the option box with a name or initials and choose what colour embroidery thread you would like for the text and the letter font style. If you want these without a name just enter No name in the text box. A unique and useful handkerchief gift for all ages.